My son is 8. He’s a maker. He makes things out of paper. He makes things out of cardboard. He makes things out of Legos and blocks and TinkerToys and egg cartons and the styrofoam that comes inside packages. We’ve spent a fortune on masking tape and scotch tape and string and markers and glue, just so he can attach things together and decorate them to make even more complex things. My son is 8. He’s a maker. Outside he makes things out of sticks and rocks and bark and leaves (at least those are still free). When it snows he makes sculptures and forts. He chalks up our driveway. And our porch. And the bricks and siding of our house. My son is 8. He’s a maker. He draws. And draws. And draws. He writes and writes. He pens stories. He authors books. He creates scavenger hunts and costumes. He creates populations and universes, filling countless notebooks and pads and poster boards and sticky notes and index cards. My son is 8. He’s a maker. He plays Spore, but mostly to design his own creatures and spacecraft. He likes Minecraft, Eden, Scratch, and Scribblenauts. He loves any video game or app that lets him make his own levels or characters or worlds (instead of playing what the designers gave him). My son is 8. He’s a maker. He makes movies using our handheld camcorder. He takes funny photos with our digital cameras or smartphones. He uses the webcam and PhotoBooth to create story episodes. He makes up new songs using the piano or music software. He makes up rhymes and dance moves. My son is 8. He’s a maker. He takes the figures and cards and tokens from multiple board games and combines them to make his own games. He repurposes card games and dice games into entirely new variations. He creates new word games and mind games and teaches us how to play on car rides or at the kitchen table. My son is 8. He’s a maker. Give him five unconnected objects and five minutes and he’ll make something amazing. He pulls the neighborhood kids into what he makes, creating communities of joyous co-creators. He pulls his classmates and his teachers and his family into what he makes, his smile and enthusiasm infecting all of us. My son is 8. He’s a maker. Will his classes enable him or quash him? Will his teachers inspire him or suppress him? Will his schools nurture his brilliant divergence or force him into a convergent, one-size-fits-all model? My son is 8. He’s a maker. His world-changing skills and talents never will be reflected in an educational world of worksheets, end-of-chapter review questions, course exams, and bubble tests. How will you accommodate and recognize his gifts? My son is 8. He’s a maker. Are you ready? This is why we are holding our first annual Maker Day at my school in FEB. Very cool! Haven’t seen that one (diy.org) before. I agree – let them PLAY, MAKE, CREATE! I am so proud when my girls play for hours, making/creating. Gets more difficult when they get older – or maybe it just looks different. Thanks for the post, Scott. Creativity is rarely a tidy thing. 🙂 Your comment is grounded in all kinds of reality! My two year old is a maker, and I love that about her. Where/when/why do we continue to crush that imaginary spirit? Thanks for another great post. Yep. I’m ready for him. I’d walk up, greet him, and say “Now tell me about what you’re making…” Then? I’d learn something from him. The future will be built on ‘makers’ who dream up and create things we never even imagined. And THAT is pretty awesome when you think about it. Your son is gifted. Too bad all kids can’t grow up in a nurturing home like yours. I do understand the point you are making, though – don’t crush kids’ creative spark with memorization drills and endless worksheets. that’s why our kids go to Brightworks School in San Francisco! I love this. I was very much the same as your son when I was growing up. After teaching regular .ed elementary school for 5 years and teaching elementary art for the last two years, I have seen how little control teachers have over what they teach, or even how they teach it. More parents need to stand up to their state/local school boards and tell everyone to back off on the standardized testing. Big business is driving the high stakes testing and squandering childhood creativity. 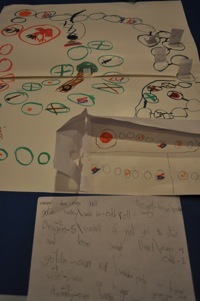 My son is 5 and he is a maker he makes worlds in minecraft – He makes cities with his trains. My son is 7 and he is a maker. He makes trailers with iMovie. He builds worlds in minecraft. My daughter is 16. She used to be a maker. She Google’s answers to worksheets for points. My daughter is 16. She used to be a maker. She takes tests that she never sees again and gets disembodied marks emailed to her phone. My daughter is 16. She used to be a maker. She no longer loves reading, writing, imagining, or making. She works tirelessly through packets of power point note handouts to find meaning. She has worked obediently to please the system but it has given her nothing in return. She is no longer a maker. Carolyn – I’m so with you. I have a 15 yr old daughter and I could say exactly the same. The grind of endless hours of AP homework have reduced her to yet another grade-addicted credit-chaser. The love of learning is fading fast and she’s quit being a creative free spirit. The worst part? She goes to a HS that gets the annual “Top 500 HS” designation due to ridiculously narrow criteria. Let’s hope they survive this! My bet to you and your daughter! I teach AP Language and Composition. I wish your daughter was a student in my class. We sketch, we design, we debate, we read, we poetry slam…we are part of a Fantasy Supreme Court League. We take photos, make movies, we share, we volunteer, we write, we laugh, we think. I know there is a test at the end. They know there is a test at the end. But I will not let that destroy the creative spirit. I promise to support her learning. I can promise she will be proud of what she accomplishes. She will be amazed by the difference she makes. She will think deeply. She will use the content to contribute to the world. She will find power in her voice. I may feel pressure to do as things have been done, but I hear Scott, “My son is 8. He is a maker…”. I look at my children. I hear their voices. I see their talents. I do not want to extinguish a fire. I want to fuel the flame. I’m not sure if my high school made that list…but I am sure I can show you what my students made and continue to make. Our students will amaze us if we only let them. I am teacher. I work to empower. Hey, Erin! I taught HS English back in the day – wish I knew then what I know now! I wish you were my daughter’s teacher as well! What a great post and testament to what teaching really is!! I wish my daughter’s teachers (and more importantly the principal) saw AP – and just teaching in general – the way you do. Unfortunately, AP in her school has become the golden calf and the end goal that the entire school revolves around. AP classes are tests of endurance and intense pressure. She had a snow day today and worked on homework all day and is still sitting here hammering away at it – and she’s a good student who really cares about doing well. Unfortunately, I see none of what you describe in my daughter’s classes. Instead, its endless reading, worksheets, tests, and watching teachers do the experiments and the talking. This is what bums me out about some of the things going on – that we allow and have educators who fall prey to silly things like being a “Top 500 HS”. The criteria for determining these high schools? # of AP courses offered, # of kids taking AP exams, & # of kids enrolled in AP. Of 27,000 HS, only about 1100 apply so in reality it means nothing and really means nothing given that hardly would be the criteria most of us would use to make such a determination. To finish on a high note, there are many schools around the area and state doing awesome things, and some great teachers in her school quietly fighting back. I’m impressed every day with the emerging leaders who are helping show the way to what learning and “school” can be. I’m pleased your one of us in the ecosystem trying to make great things happen! Your comment is poetry–> sad, mournful, truthful poetry. This is the most honest and sad thing I’ve read all week. I’m terrified that my youngest daughter is on her way to losing her love of school and learning and making. The standardized and archaic way in which we often do business in the American school system is stifling EVERYONE. Teachers. Parents. Most importantly –> Our makers, the students. My daughter. I could cry. My daughter is 5 and she is a maker. So I moved to a community with a free public Montessori and I get to see her thrive! Mhy 9-yr old son and 7-yr old daughter are makers, artists, brilliant gems of creativity for whom I share your concern. It is heartbreaking to see a well-intended system do this to childhood. Our state recently passed legislation allowing parents who disagree with curriculum to make a case to have their children not be subjected to it, but must provide an agreed-upon alternative. I fear I may have to pull that card in the future to basically half-home-school them through meaningful activities and protect them from the mind-numbing 19th/20th century programming so many schools are stuck in. I don’t know. But it is a thought I have had. Thanks for sharing this. It is a powerful, poignant piece. Ah, a budding creative. So likely, he’ll do what other creatives (disclaimer: like myself) do in a world that offers, at best, a hat tip to the arts – he’ll choose. The system will not make or break him, he will. The system will test him: his durability, his passion, his affection for critical thinking, his ability to make connections between unconnected things in the world. The system will test him, and try him, and it will eat at him daily. It may award him with a salary offering meager living. And in a world that prizes ‘stuff’ and ‘possessions’, this, too, will eat at him. If he endures, he’ll wake up happy, ready to attack the day, soul fulfilled by the day’s challenges. He’ll arrive daily at that destination to the elusive pilgrimage at which so many fail. He’ll be happy. Being creative. So choose. But don’t blame education’s compassion or understanding if he lacks the resolve to continue. Creatives have existed DESPITE education for many, many years. My “maker” mentality suffered an attempted assassination by my school system here in New England after a typical, ‘preparing you for a job’, type school experience. I struggled to find my way in college because I wanted to be a maker everyday of my life but…what major is that exactly…? Well entrepreneurship and engineering are the closest. I’m back to being a maker and I’m making a new school system for students, one to help them explore and develop their maker minds while preparing them to be beneficial contributors to society. I envision a computer centric school program with creation at the core. A self guided learning environment with creation focused software to power it. The mission is to help children learn to evolve their creative thinking and find ways to benefit society with their talents. Oh! Use that ‘maker’ in you, and make a school system for other makers. I’m probably one of those kids! But now I’m a grandma, and I have to not be a maker most of the time, but I use Virtual Worlds to fulfill that creativity within me! Thank you for this post! My son is 8, too and hates school because they do not let him make anything there, so boring! These makers have the capacity to see outside the box that we adults put ourselves into if only we would listen to them and let them do it. I think we should make a meme out of this. Everyone write your own post. That is my son too… He is 9 and very inquisitive about the things he likes. He is a wonderful drawer and his imagination is amazing, but when it comes to school work, he hates it. He does not understand why he needs to do so much math and other things that are not related to animals. When I told him that if he practices more math it will become easier for him, and I asked him to use the same technique he uses to learn and memorize facts about animals to memorize the multiplication tables, he responded that he remembers those things because he likes them and finds them interesting, but math is not the same…. Her words are frightening because of how she sees herself and what school has done to her. I agree with you 100% – these are my two boys too and I have fears of them going into a system where their creativity and imagination and passion for learning might be ignored in favor of more traditional “learning”. I am keeping my fingers crossed that I know there are some amazing educators in our school system who will help them blossom and grow and nurture their gifts. Thanks for this. I showed this article to his parents and they loved it. My sister took it in to show the teacher and explained that this was what my nephew was really like. He needs a lot of this hands on excitement for learning. I have been non your subscription list for some time. Also, I wanted to show you this page! here is hope. Bye for now! I run the Design Lab at my school. The two biggest challenges I face are getting people to understand that design is about more than thinking about things, but that it genuinely involves making; and that – because design is more intense work – it’s worthwhile to take time away from worksheets for it.